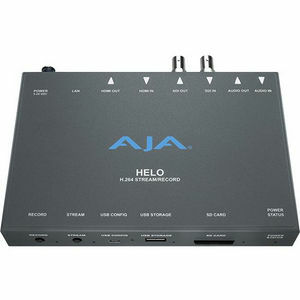 HELO is AJA's new H.264 streaming and recording stand-alone appliance. HELO brings both SDI and HDMI I/O into a single appliance with the ability to simultaneously stream out to your Content Delivery Network (CDN) as well as encode and record beautiful H.264 files to either SD, SDHC or SDXC cards, USB storage or NFS or CIFS mounted network based storage simultaneously. HELO's small and robust form factor is essential for your busy schedule. Live events, webcasts, production and post locations vary and you need a device that can take the heat. HELO is designed to travel well, fit wherever needed and continuously deliver; all with full size connectivity. HELO offers both 3G-SDI and HDMI source inputs in a single device with the ability to encode up to 1080p 60 in beautiful and efficient H.264. Your goal is efficiency with beautiful results. HELO encodes to H.264/MPEG-4 ensuring bandwidth efficiencies with widely compatible files. From tablets to smartphones, desktops to Smart TVs, no translation necessary. 2-Channel stereo audio can be encoded at up to 24-bit 48kHz at data rates ranging from 32kbps to 256kps in MPEG-4 AAC-LC, allowing you to make the most appropriate choice for your project's needs. Stream out to your CDN and record to SD, SDHC or SDXC cards, USB storage or NFS or CIFS mounted network based shares simultaneously. Streaming can be complex. HELO makes it simple. A USB connection and robust web browser based UI allows you to setup and configure your CDN connection before you even arrive at your event. Once there, simply press the Stream button and deliver your project across HELO's Ethernet connection, which allows support for RTP/RTSP, RTMP as well as Unicast. HELO's web based GUI even proveds a video preview window so that you can ensure you are getting just what you expect. v2.1 firmware and above expands your reach with new HTTP Live Streaming (HLS) support, compatible with Apple's popular iOS devices and more. Additionally v3.0 firmware and above adds RTMPE support for FaceBook Live, further expanding your reach to audiences anywhere. Live means Now. Live means Pressure. HELO offers a dedicated Record button right on the front of HELO's small and mobile interface for immediate recording. It also provides simultaneous recording while streaming and redundant recording of one file to two media destinations simultaneously. This enables you to hand a client a copy of the event right after recording ends, while maintaining a master in house. HELO's H.264 based encoding not only ensures beautiful, efficiently sized files, it means your recording medium choices are wide open. Utilize USB thumb sticks, drives and RAIDs, common SD, SDHC or SDXC media or network shares across a switch. Pick to suit your project. HELO opens up a world of new streaming workflows for AV, live events, houses of worship, webcasting, corporate communications, production and post. HELO offers a scheduler that triggers pre-planned start and stop of recording and streaming media simplifying projects that require definitive schedules. The schedule may be programmed locally through HELO's web UI, by importing ICS files or by linking to external calendar providers such as Google Calendar.